1. 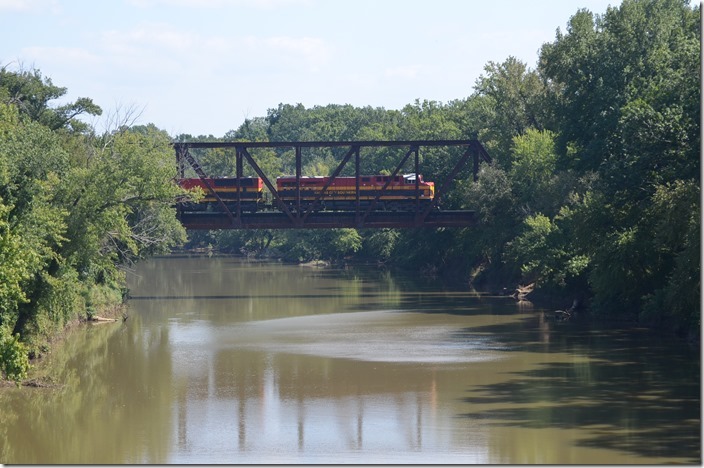 Freight M-KCSH pulls south of the yard across the Poteau River bridge. 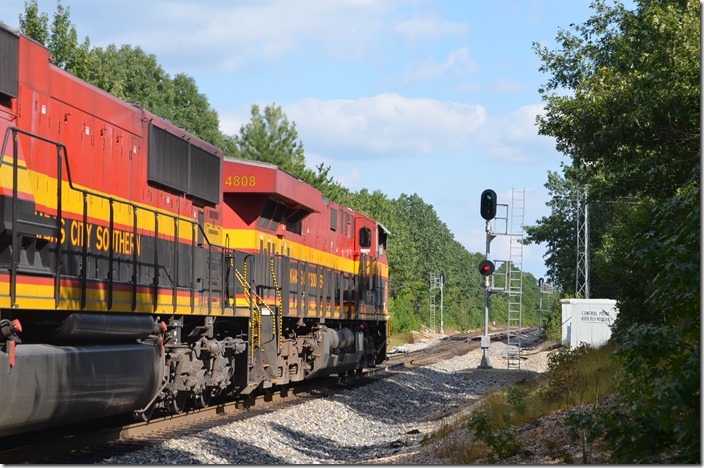 KCS 4808-3918 Hodgens OK.
2. 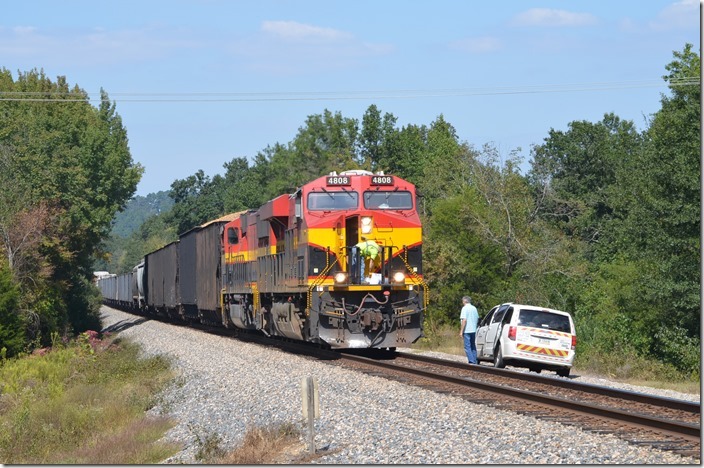 At Hodgens OK the train stops briefly to pick up the conductor who was brought out by the yard taxi. 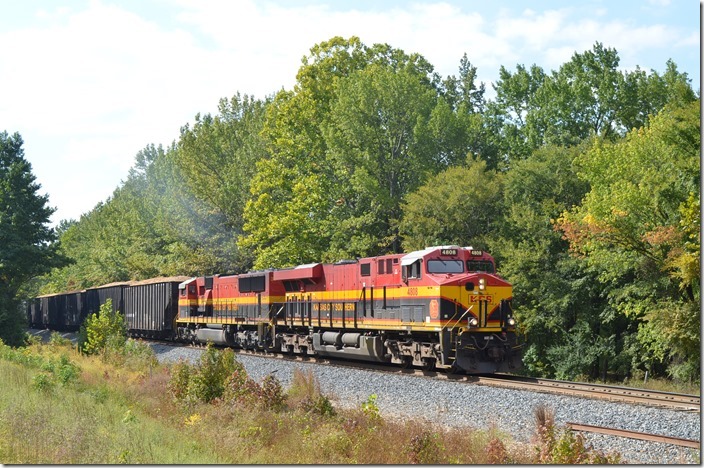 KCS 4808-3918 Hodgens OK.
3. 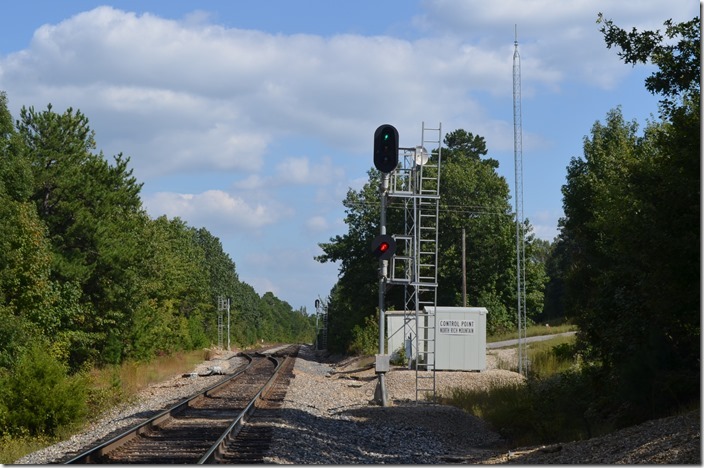 About 15 miles south at Page is the first passing siding on the Shreveport Sub. 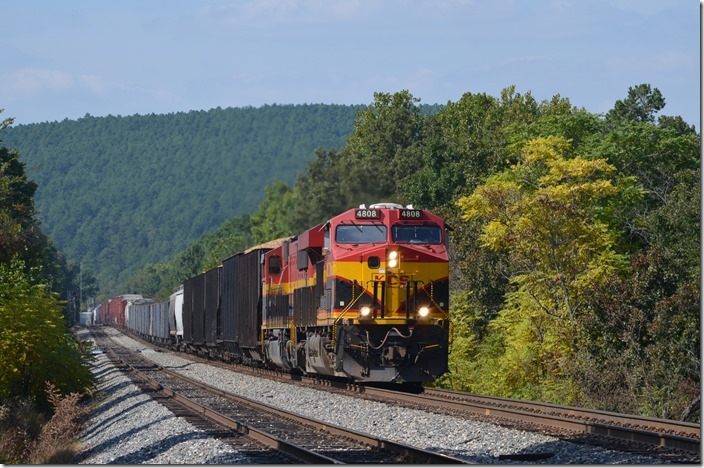 We find a northbound manifest with no crew parked in the siding. Yes, the Ozarks are pretty good size mountains! Reminds me of Southwest Virginia. KCS 4607-3951-3955 Page OK.
4. 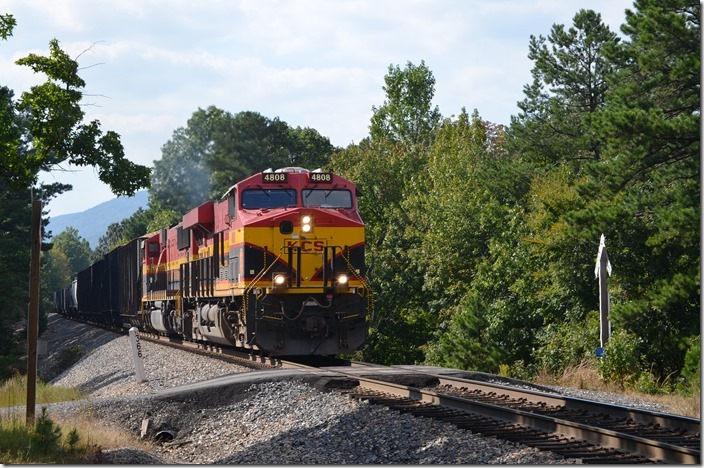 KCS 4808-3918 get a brief respite from the steep southbound grade as they roll through the bowl at Page OK.
5. 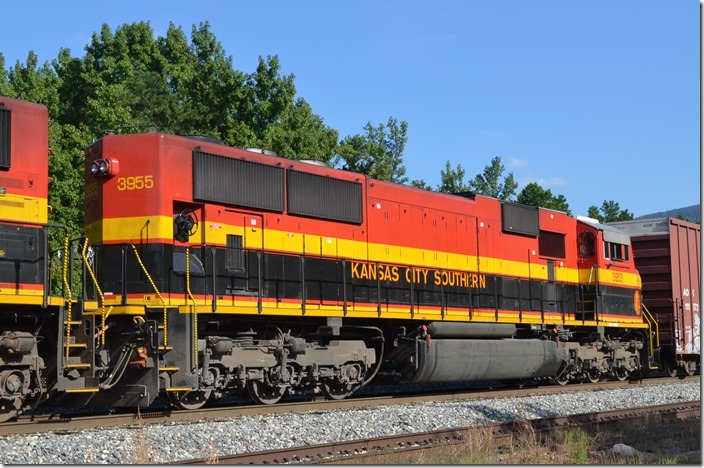 KCS 4808-4607 Page OK.
6. KCS DPU 4015 Page OK.
7. 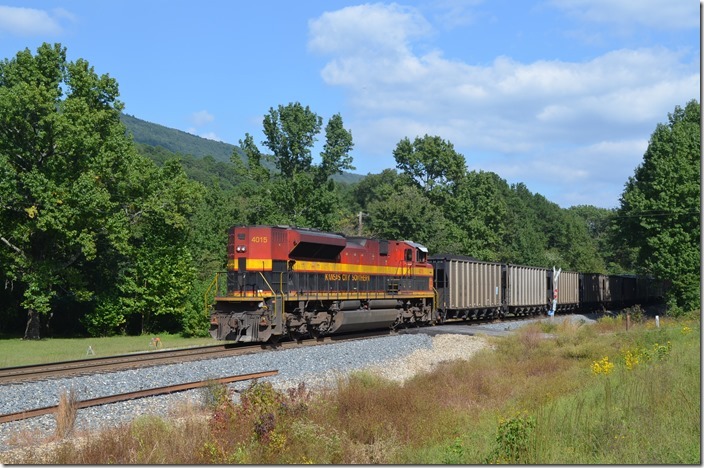 KCS DPU 4015 Page OK. View 2. 8. Now he’s down draggin’ on the grade at Howard AK. 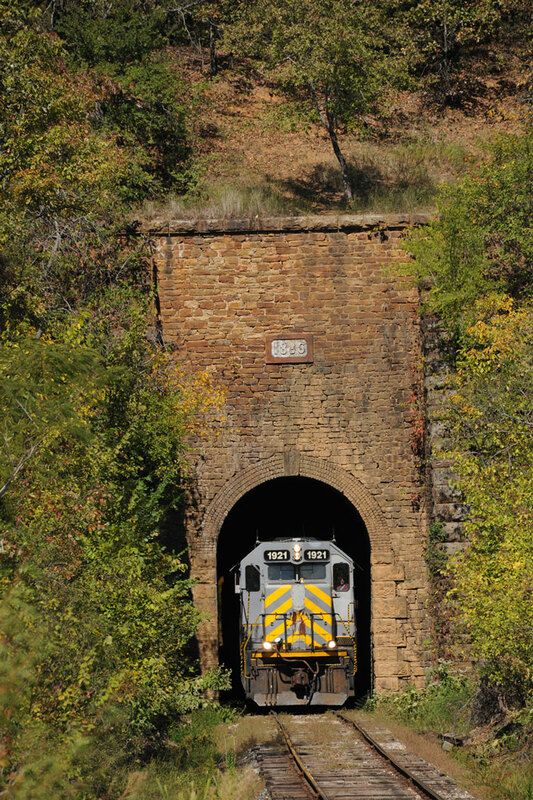 KCS 4808-3918. 9. KCS DPU 4015 Howard AK. 10. 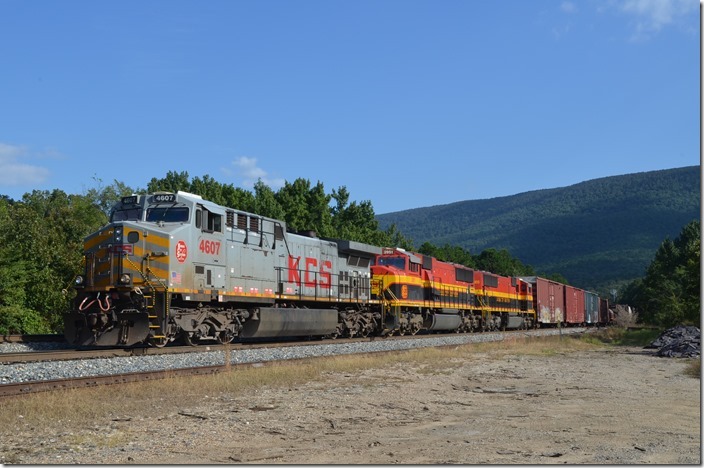 KCS clear signal at the north end of Rich Mt AK passing siding. There is very little highway traffic and very few houses along the highway south of Heavener. I wouldn’t call Page or Rich Mountain towns. 11. Passing milepost 366 (from Kansas City). 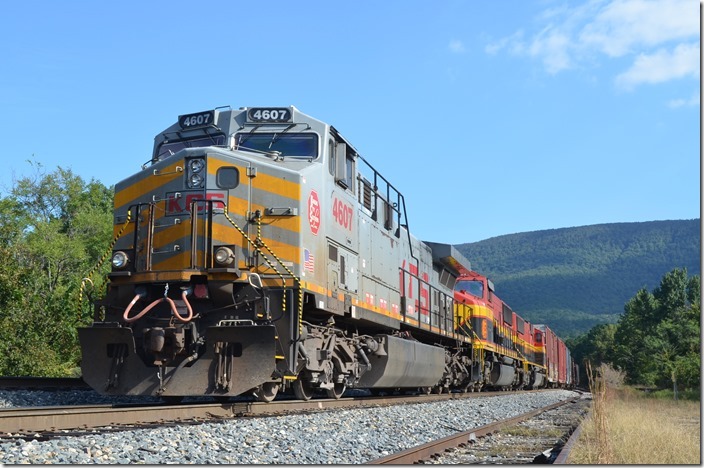 KCS 4808-3918 Rich Mt AK. 12. 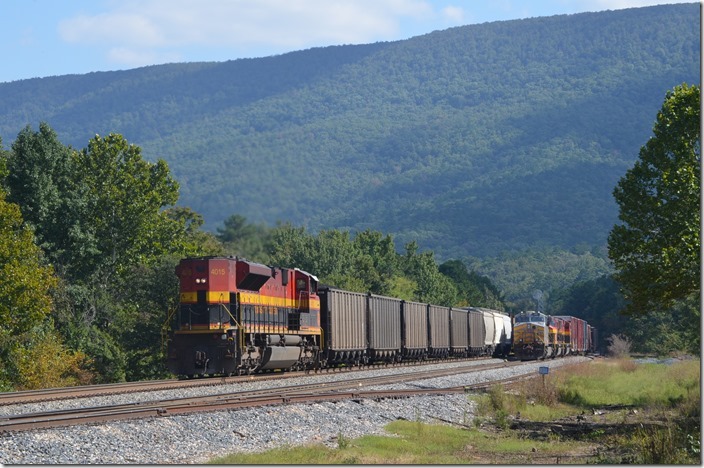 KCS 4808-3918 Rich Mt AK. 13. KCS DPU 4015 Rich Mt AK. 14. 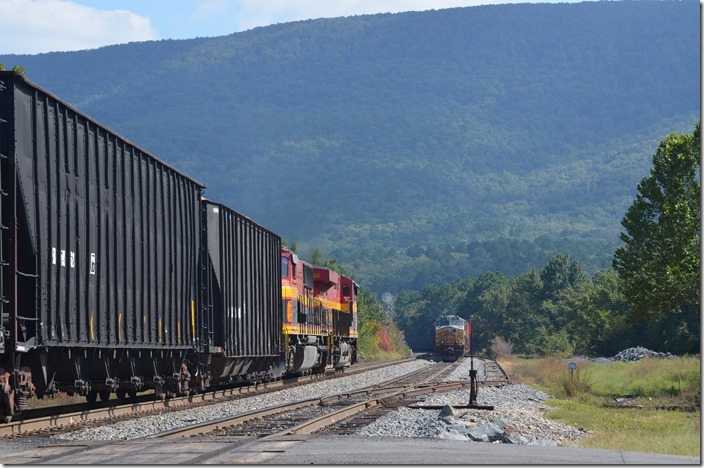 Once over the hump of Rich Mountain the major impediments were over for M-KCSH. We headed the 12 miles back to Page OK to check if a crew showed up. They had not, so I chose to roster the locomotives. KCS 4607-3951-3955 Page OK.
15. 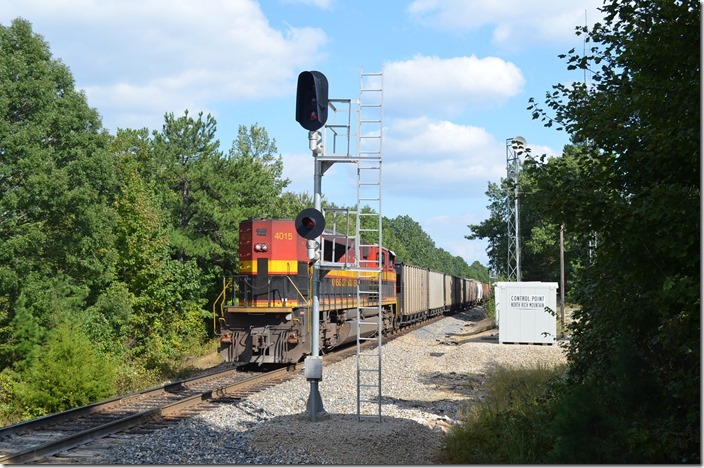 KCS 4607 is a GE AC4400CW built 11-99. Page OK.
16. 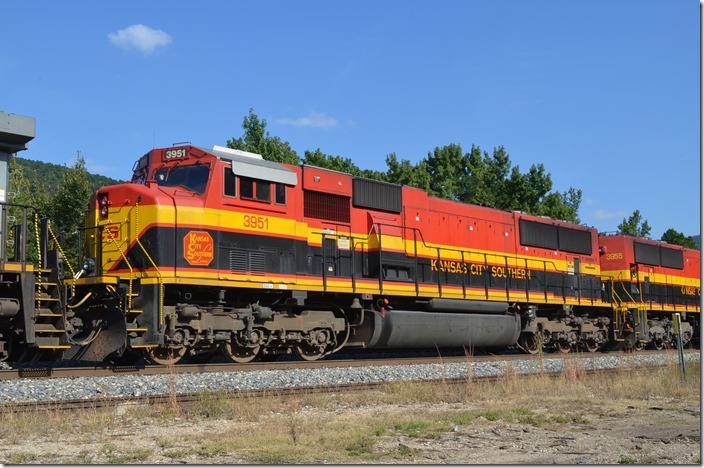 KCS SD70MAC 3951 is ex-TFM 1651 and was built 1-2000. Page OK.
17. 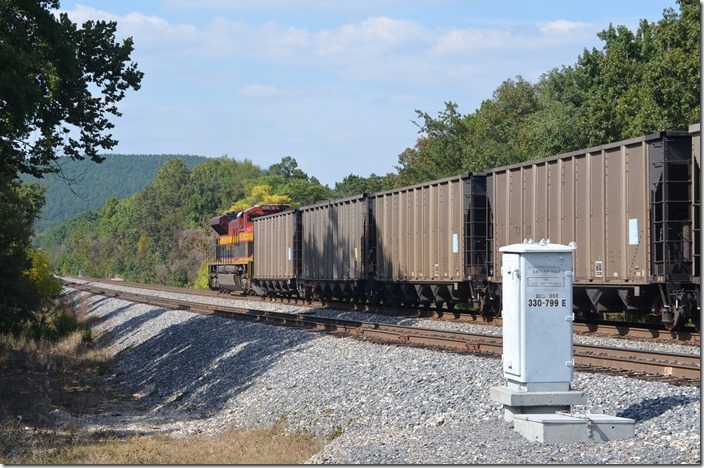 KCS SD70ACe 3951 Page OK. View 2. 18. 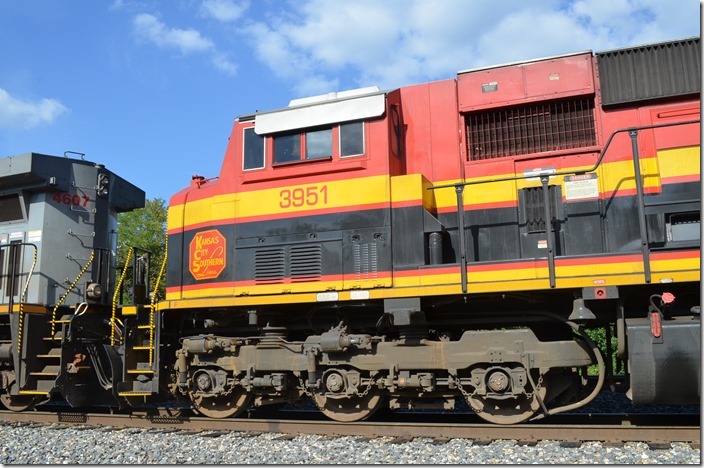 KCS SD70MAC 3955 is ex-TFM 1655 and was built in 2-2000. Page OK.
19. KCS 4607-3951-3955 Page OK.
20. 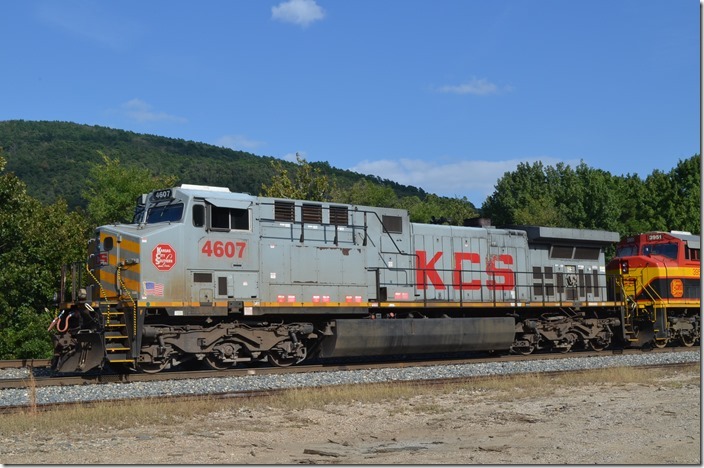 KCS AC4400CW 4607 Page OK with logo. Time to point the truck toward the east. We headed back up to Fort Smith for the night. 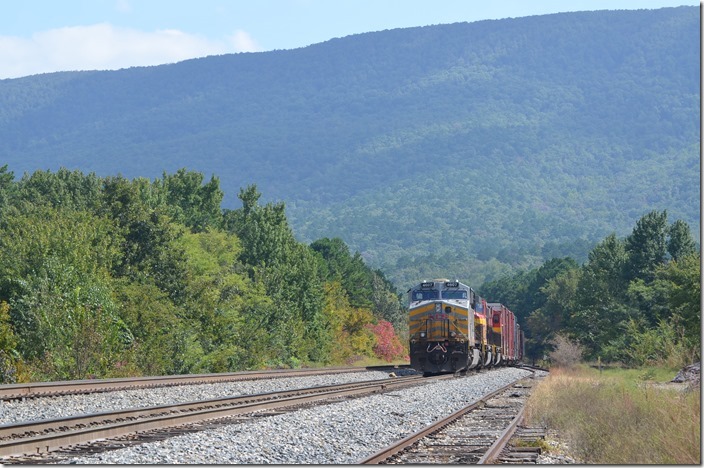 Along the way we traversed some beautiful Arkansas farm and mountain country. Hopefully I can make it back to the KCS again. Attachment 1 - Shreveport Subdivision information; pdf, 1 page. Attachment 2 - Shreveport Profile elevation graphic; pdf, 1 page. C1. Fort Smith Dodger exiting the tunnel. Train images used by permission of Everett N Young and Kevin.